It’s always a sad story when Mother Nature takes a swing at small businesses, but a story coming out of Prunedale, California just might be sadder because of one extra, crucial factor—there was intention behind the destruction, and it was completely unnecessary and cruel. 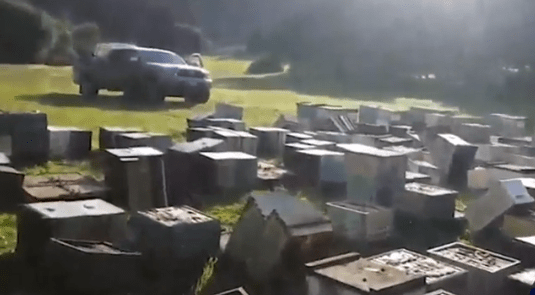 In the small community of Prunedale, one or more vandals toppled over up to 100 bee hives and sprayed the poor bees inside (of which there were at least 200,000) with diesel fuel, effectively killing every last one of them. These honeybees, under the care of Mike Hickenbottom, were being hosted on the Prunedale property for the winter season. The hives are actually owned by an individual who resides in California’s Central Valley, and it’s considered too cold to host the bees during the colder winter months up there. They did well in Prunedale, as they often fed from the many eucalyptus trees in the area that flower during winter. Hickenbottom suspects his neighbors of being behind the senseless incident, in part because they complained about the bees to him on at least three separate occasions. The bees had been allowed to freely fly around Hickenbottom’s property, and his neighbors claimed their kids were too afraid to be outside because of the honeybees’ free reign. Hickenbottom had insisted that, unlike Africanized honeybees, his Russian and Italian bees were not aggressive strains that would attack without provocation. “I go up around the bee boxes without any protective clothing on. I’ve never been stung,” Hickenbottom said. The vandals hit the hives between 10:30 am and 3:00 pm on Saturday January 13. “Somebody came here, and tipped over all the boxes, and sprayed them with diesel fuel. It killed a whole bunch of bees,” says Alfonzo Perez, the beekeeper who owned the now destroyed hives. Like many beekeepers, Perez leases his hives to almond farmers to pollinate their trees all across California. The mass annihilation of Perez’s bees will cost him over $50,000, which was meant to act as a large portion of his yearly salary—a fact that is made all the worse by the fact that Perez has a family and a baby due in February. “I just feel really bad for Alfonzo, because he works so hard to support his family. Then, somebody goes and does something like this,” says Hickenbottom. The parties involved have filed a report with the Monterey County Sheriff’s Office, but so far there have been no arrests. It’s also not known if Hickenbottom’s neighbors are official suspects. Carolina Urban Beekeepers Saving Bees This WinterTasmania: First to Have Manuka Honey?